"You are what you eat" is the guiding principle behind a new study comparing the diet of birds today with that of birds dead for more than a century. The results show large changes in the diets of aerial insectivores, or birds such as swallows, swifts, martins and whip-poor-wills that consume insects while in mid-flight. Today, the bulk of the birds' diet is made up of small insects at the lower end of the food web, or at a lower "trophic" level, the researchers say. "Higher up on a trophic level might be steak," said Joe Nocera, an assistant professor of forestry and environmental management at the University of New Brunswick and one of the authors of the paper. "Lower on a trophic level might be a salad. You'd have to eat a lot more salad to make up for that steak." For example, whip-poor-wills today still have to eat insects, Nocera said, but what they have to choose from isn't as beneficial as it was 100 years ago. 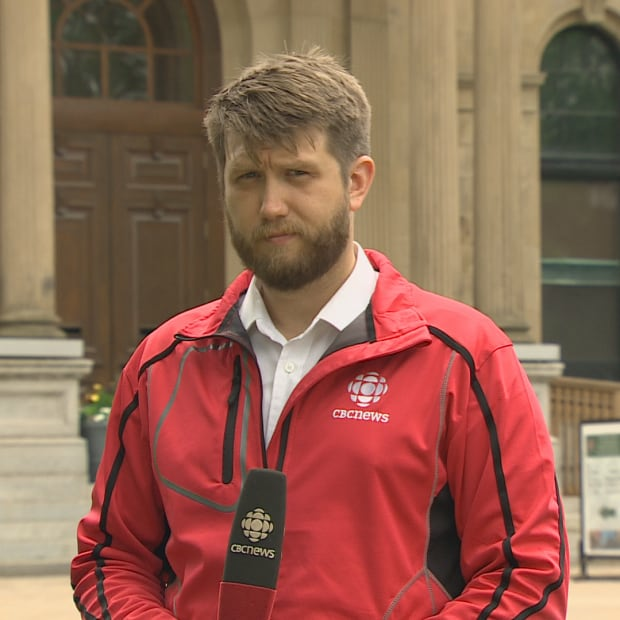 Joe Nocera, an assistant professor of forestry and environmental management at UNB, is an author of the paper, along with Philina English and David Green of Simon Fraser University. (Shane Fowler/CBC)Using stable isotopes, or molecules found in the food eaten by birds, researchers have been able to map the changes in diet for species such as whip-poor-wills back to the 1800s. 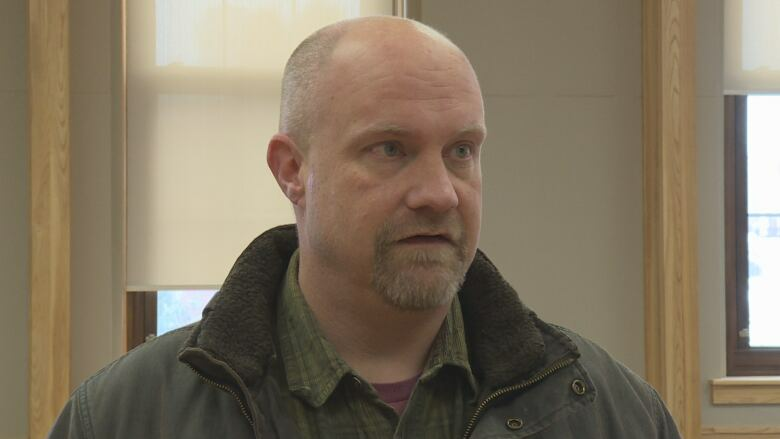 "It's a species that used to be common in New Brunswick, but isn't anymore," Nocera said. "So we looked at Ontario populations. And we wanted to know what's driving their population declines over the past century." Nocera said most species of aerial insectivores, including swifts and swallows, have been in severe decline and he thinks it's most likely a response to declines in insect populations. 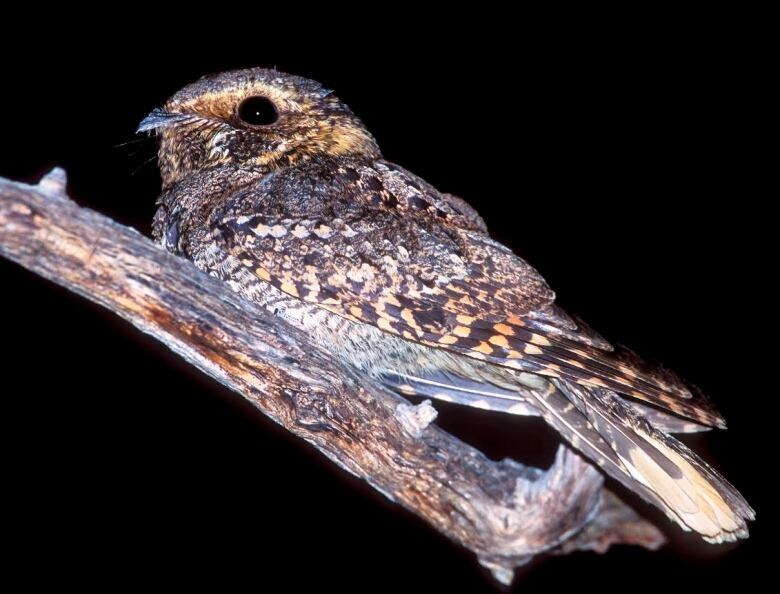 By using museum specimens of whip-poor-wills collected as far back as the 1880s, researchers were able to determine what those birds consumed and compare their diets to birds of the same species collected this century. Determining the diet of the birds that lived more than 130 years ago is done by examining stable isotopes, a type of biological tracer, found in the museum specimens. "When a bird, or any animal for that matter, eats something, it incorporates all the molecules of that item into its own tissues," said Nocera. "In the case of a bird, when it grows feathers it has the chemical makeup, partly, of what it's been eating." By tracking nitrogen isotopes in the birds since 1880, researchers are able to also track their food intake. "The long story short is that it has changed, and fairly dramatically, for both adults and chicks, over the past century," Nocera said. The paper is titled "Stable Isotopes from Museum Specimens May Provide Evidence of Long-Term Change in the Trophic Ecology of a Migratory Aerial Insectivore." Written by Philina English and David Green of Simon Fraser University as well as Nocera, it was published last month in Frontiers in Ecology and Evolution. The study's reliance on museum collections highlights the need to properly curate and maintain zoological collections. 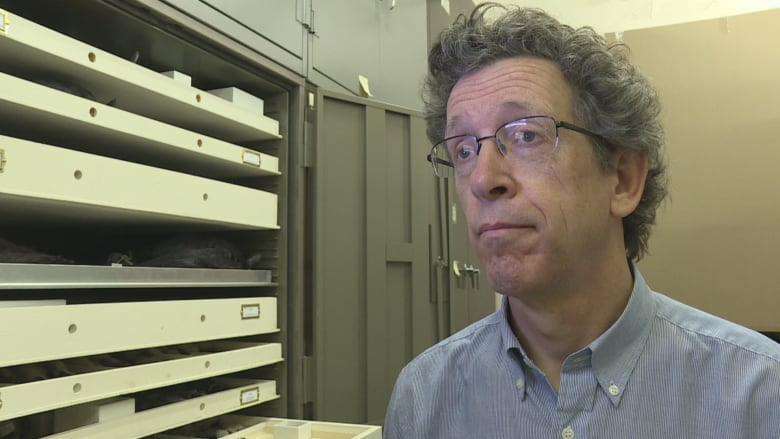 Although no specimens from the New Brunswick Museum were used in this study, the curator of zoology there, Donald McAlpine, said the study shows it's important to maintain and grow specimen collections for future research. "At the time those collections were assembled, the technology that is being used now didn't exist," McAlpine said. "People couldn't have imagined how these specimens would be used." 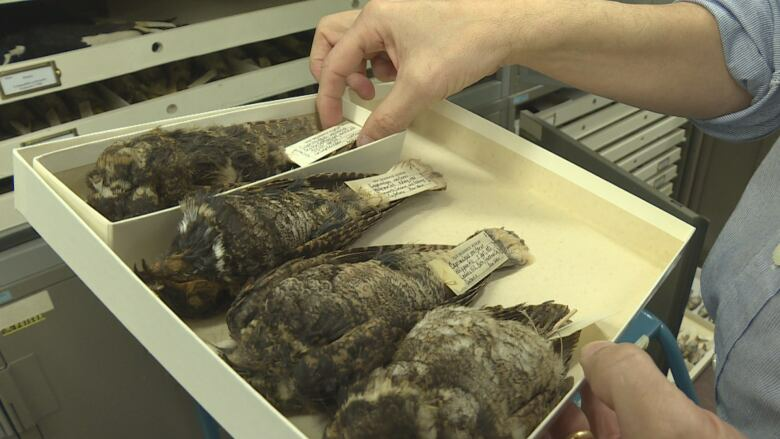 McAlpine said the New Brunswick Museum has about 13,000 birds in its collection and sends dozens of samples of specimens each year to researchers for similar studies. "Some of these new technologies have allowed us to extract DNA, stable isotopes, to use birds for toxicological work," he said. "They're being used in a wide variety of ways and this paper is a great demonstration of one of those ways, but also in how this technology is unlocking the stories these specimens have to tell." 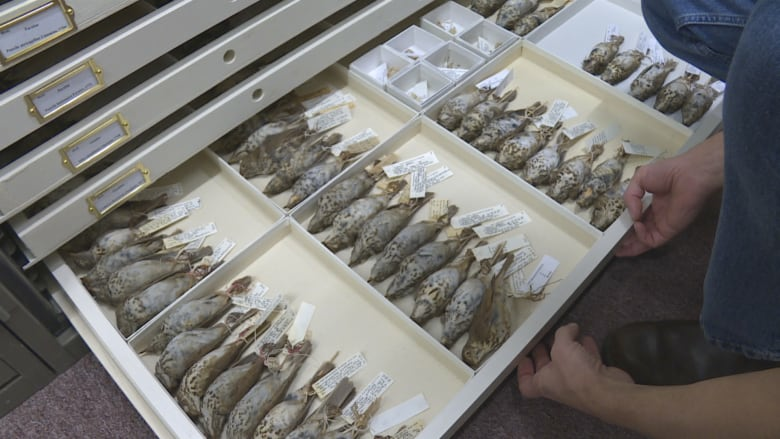 Determining the diet of birds that have been long dead was a challenge for the researchers. "Stable isotopes are especially difficult to interpret at large scales," said English, the primary author of the study. "So eliminating alternative explanations for the patterns we found was particularly challenging." "Also, because historical museum specimens were not collected with your particular future questions in mind, they are rarely distributed ideally to answer a particular question. New techniques that allow more and more detailed isotope information to be extracted from each specimen have the potential to make this easier." But regardless of the difficulty of the study the research is significant, English said. "This research is also especially important because it identifies key challenges in using this approach and the ways emerging techniques will help to overcome these challenges," she said. While changes in the diet of some birds may not seem drastic to some, Nocera warned there is an impact on humans. "Insects drive all the pollination services that we avail ourselves of, whether that be fruits or vegetables produced through pollination, or trees produced through pollination," he said. "Without those insect services, I don't think we would have the quality of life we have today. It would actually be impossible."